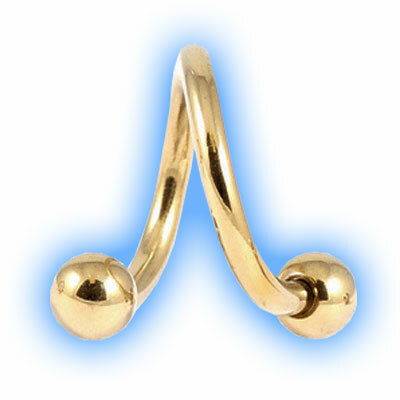 This Gold PVD Titanium Twister, sometimes called a spiral, is an unusual piece of Body Jewellery which can be worn in many different piercings, it looks great in pierced ear lobes and also in navel piercings, it is a great way to disguise wonky navel piercings that don't quite line up! If the piercing is slightly off centre a standard belly bar can look a bit odd if it is at a strange angle but these body spirals hide that, they look great and no one would notice that the piercing is crooked. Because of the Hypoallergenic Gold PVD coating which has been applied to the Titanium the twister is a great choice to wear as it is biocompatible and less likely to cause any irritation. The thickness is 1.6mm (14 gauge) and diameter 12mm (1/2") and 6mm balls.